Officials said they believe the latest earthquake activity in northeast Ohio is related to the injection of wastewater into the ground near a fault line, creating enough pressure to cause seismic activity. The brine wastewater comes from drilling operations that use the so-called fracking process to extract gas from underground shale. But Ohio Department of Natural Resources Director Jim Zehringer said during a news teleconference that fracking is not causing the quakes. 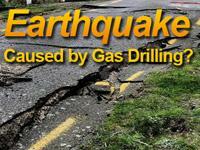 “The seismic events are not a direct result of fracking,” he said. Environmentalists and property owners who live near gas drilling wells have questioned the safety of fracking to the environment and public health. Federal regulators have declared the technology safe, however. Zehringer said four injection wells within a 5-mile (8-kilometer) radius of an already shuttered well in Youngstown will remain inactive while further scientific research is conducted. A 4.0 magnitude quake on Dec. 31, 2011, in the afternoon in McDonald, outside of Youngstown, was the 11th in a series of minor earthquakes in area, many of which have struck near the Youngstown injection well. The quake caused no serious injuries or property damage, Zehringer said. Thousands of gallons of brine were injected into the well daily until its owner, Northstar Disposal Services LLC, agreed to stop injecting brine into the earth as a precaution while authorities assess any potential links to the quakes. Michael Hansen of the Ohio Seismic Network said that more quakes are possible, most likely small ones, until the pressure at the fault line has been completely relieved. The temblor Saturday appeared to be stronger than others, which generally had a magnitude of 2.7 or lower. Some residents reported feeling trembling farther south into Columbiana County and east into western Pennsylvania. Area residents said a loud boom accompanied the shaking. It sent some stunned residents running for cover as bookshelves shook and pictures and lamps fell from tables. A few miles from the epicenter, Charles Kihm said he was preparing food in his kitchen when he heard a noise and thought a vehicle had hit his Austintown home. There are 177 similar injection wells around the state, and the Youngstown-area well has been the only site with seismic activity, the department said. Zehringer said that to shut down all of the wells because of seismic activity near one would be an overreaction.